These highlights do not include all the information needed to use AMLODIPINE AND OLMESARTAN MEDOXOMIL TABLETS safely and effectively. See full prescribing information for AMLODIPINE AND OLMESARTAN MEDOXOMIL TABLETS. • Amlodipine and olmesartan medoxomil tablets are a combination of dihydropyridine calcium channel blocker and angiotensin II receptor blocker combination product indicated for the treatment of hypertension, alone or with other antihypertensive agents, to lower blood pressure. Lowering blood pressure reduces the risk of fatal and nonfatal cardiovascular events, primarily strokes and myocardial infarctions. (1). • Recommended starting dose: 5/20 mg once daily (2). • Titrate as needed in two weeks intervals up to a maximum of 10/40 mg once daily (2). Do not co-administer aliskiren with amlodipine and olmesartan medoxomil tablets in patients with diabetes (4). Most common adverse reaction (incidence ≥3%) is edema (6.1). To report SUSPECTED ADVERSE REACTIONS, contact Alembic Pharmaceuticals Limited at 1-866-210-9797 or FDA at 1-800-332-1088 or www.fda.gov/medwatch. • If simvastatin is co-administered with amlodipine, do not exceed doses greater than 20 mg daily of simvastatin. • Increased exposure of cyclosporin and tacrolimus. • Increased exposure of amlodipine when coadminstred with CYP3A inhibitors. Nonsteroidal anti-inflammatory drugs (NSAIDS) may lead to increased risk of renal impairment and loss of antihypertensive effect. Dual inhibition of the renin-angiotensin system: Increased risk of renal impairment, hypotension, and hyperkalemia. Colesevelam hydrochloride: Consider administering olmesartan at least 4 hours before colesevelam hydrochloride dose. Lithium: Increases in serum lithium concentrations and lithium toxicity. 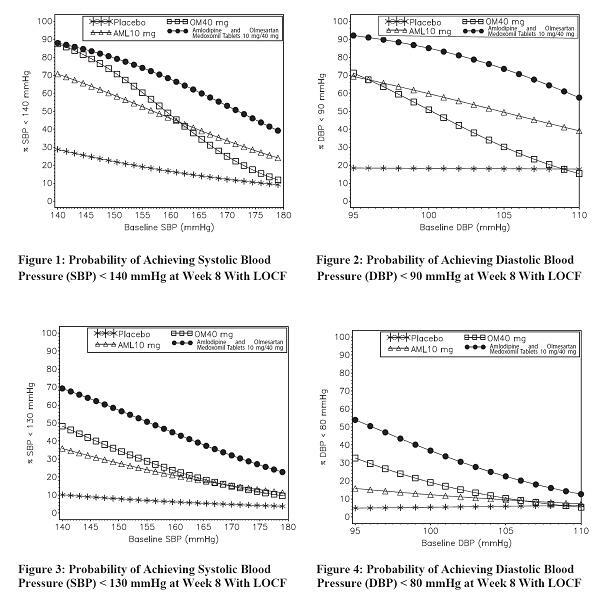 The figures above provide an approximation of the likelihood of reaching a targeted blood pressure goal (e.g., Week 8 SBP <140 mmHg or <130 mmHg or a DBP <90 mmHg or <80 mmHg) for the high-dose treatment groups evaluated in the study. Amlodipine and olmesartan medoxomil tablets 5/20 mg, the lowest dose combination treatment group, increases the probability of reaching blood pressure goal compared with the highest dose monotherapies, amlodipine 10 mg and olmesartan medoxomil 40 mg.
For example, a patient with a baseline blood pressure of 160/100 mmHg has about a 48% likelihood of achieving a goal of <140 mmHg (systolic) and a 51% likelihood of achieving a goal of <90 mmHg (diastolic) on monotherapy with olmesartan medoxomil 40 mg, and about a 46% likelihood of achieving a goal of <140 mmHg (systolic) and a 60% likelihood of achieving a goal of <90 mmHg (diastolic) on monotherapy with amlodipine 10 mg. The likelihood of achieving these same goals increases to 63% (systolic) and 71% (diastolic) on amlodipine and olmesartan medoxomil tablets 5/20 mg, and to 68% (systolic) and 85% (diastolic) on amlodipine and olmesartan medoxomil tablets 10/40 mg. The usual starting dose of amlodipine and olmesartan medoxomil tablet is 5/20 mg once daily. The dosage can be increased after 1 to 2 weeks of therapy to a maximum dose of one 10/40 mg tablet once daily as needed to control blood pressure [seeClinical Studies (14.1)]. Dosage may be increased after 2 weeks. The maximum recommended dose of amlodipine and olmesartan medoxomil tablet is 10/40 mg.
5 mg/20 mg: White round shape, film-coated debossed with ‘454’ on one side and plain on other side. 5 mg/40 mg: Cream round shape, film-coated tablets debossed with ‘456’ on one side and plain on other side. 10 mg/20 mg: Grayish orange round shape, film-coated tablets debossed with ‘455’ on one side and plain on other side. 10 mg/40 mg: Brownish red round shape, film-coated tablets debossed with ‘457’ on one side and plain on the other side. Do not co-administer aliskiren with amlodipine and olmesartan medoxomil tablets in patients with diabetes [see Drug Interactions ( 7.2)]. Use of drugs that act on the renin-angiotensin system during the second and third trimesters of pregnancy reduces fetal renal function and increases fetal and neonatal morbidity and death. Resulting oligohydramnios can be associated with fetal lung hypoplasia and skeletal deformations. Potential neonatal adverse effects include skull hypoplasia, anuria, hypotension, renal failure, and death. When pregnancy is detected, discontinue amlodipine and olmesartan medoxomil tablets as soon as possible [seeUse in specific Populations (8.1]. In patients with an activated renin-angiotensin system, such as volume- and/or salt-depleted patients (e.g., those being treated with high doses of diuretics) symptomatic hypotension may be anticipated after initiation of treatment with olmesartan medoxomil. Initiate treatment with amlodipine and olmesartan medoxomil tablets under close medical supervision. If hypotension does occur, place the patient in the supine position and, if necessary, give an intravenous infusion of normal saline. A transient hypotensive response is not a contraindication to further treatment, which usually can be continued without difficulty once the blood pressure has stabilized. Since the vasodilation attributable to amlodipine in amlodipine and olmesartan medoxomil tablets is gradual in onset, acute hypotension has rarely been reported after oral administration. Nonetheless, exercise caution, as with any other peripheral vasodilator, when administering amlodipine and olmesartan medoxomil tablets, particularly in patients with severe aortic stenosis. Changes in renal function may be anticipated in susceptible individuals treated with olmesartan medoxomil as a consequence of inhibiting the renin-angiotensin-aldosterone system. In patients whose renal function may depend upon the activity of the renin-angiotensin-aldosterone system (e.g., patients with severe congestive heart failure), treatment with angiotensin converting enzyme inhibitors and angiotensin receptor antagonists has been associated with oliguria or progressive azotemia and (rarely) with acute renal failure and/or death. Similar effects may occur in patients treated with amlodipine and olmesartan medoxomil tablets because of the olmesartan medoxomil component [seeDrug Interactions (7) and Clinical Pharmacology (12.3)]. Patients with hepatic impairment have decreased clearance of amlodipine. Starting amlodipine or adding amlodipine at 2.5 mg in hepatically impaired patients is recommended. The lowest dose of amlodipine and olmesartan medoxomil tablets are 5/20 mg; therefore, initial therapy with amlodipine and olmesartan medoxomil tablets are not recommended in hepatically impaired patients [seeUse in Specific Populations (8.6)]. Severe, chronic diarrhea with substantial weight loss has been reported in patients taking olmesartan months to years after drug initiation. Intestinal biopsies of patients often demonstrated villous atrophy. If a patient develops these symptoms during treatment with olmesartan, exclude other etiologies. Consider discontinuation of amlodipine and olmesartan medoxomil tablets in cases where no other etiology is identified. Amlodipine and olmesartan medoxomil tablet contains olmesartan, a drug that inhibits the renin-angiotensin system (RAS). Drugs that inhibit the RAS can cause hyperkalemia. Monitor serum electrolytes periodically. N=160 to 163 subjects per treatment group. The epidemiologic study included patients 65 years and older with overall exposure of > 300,000 patient-years. In the sub-group of diabetic patients receiving high-dose olmesartan (40 mg/d) for > 6 months, there appeared to be an increased risk of death (HR 2, 95% CI 1.1, 3.8) compared to similar patients taking other angiotensin receptor blockers. In contrast, high-dose olmesartan use in non-diabetic patients appeared to be associated with a decreased risk of death (HR 0.46, 95% CI 0.24, 0.86) compared to similar patients taking other angiotensin receptor blockers. No differences were observed between the groups receiving lower doses of olmesartan compared to other angiotensin blockers or those receiving therapy for < 6 months. CYP3A Inhibitors: Co-administration of amlodipine with CYP3A inhibitors (moderate and strong) results in increased systemic exposure to amlodipine and may require dose reduction. Monitor for symptoms of hypotension and edema when amlodipine is co-administered with CYP3A inhibitors to determine the need for dose adjustment. Dual blockade of the RAS with angiotensin receptor blockers, ACE inhibitors, or aliskiren is associated with increased risks of hypotension, hyperkalemia, and changes in renal function (including acute renal failure) compared to monotherapy. Most patients receiving the combination of two RAS inhibitors do not obtain any additional benefit compared to monotherapy. In general, avoid combined use of RAS inhibitors. Closely monitor blood pressure, renal function and electrolytes in patients on amlodipine and olmesartan medoxomil tablets and other agents that affect the RAS. Do not co-administer aliskiren with amlodipine and olmesartan medoxomil tablets in patients with diabetes [see Contraindications (4)]. Avoid use of aliskiren with amlodipine and olmesartan medoxomil tablets in patients with renal impairment (GFR <60 ml/min). Use of drugs that act on the renin-angiotensin system during the second and third trimesters of pregnancy reduces fetal renal function and increases fetal and neonatal morbidity and death. Resulting oligohydramnios can be associated with fetal lung hypoplasia and skeletal deformations. Potential neonatal adverse effects include skull hypoplasia, anuria, hypotension, renal failure, and death. When pregnancy is detected, discontinue amlodipine and olmesartan medoxomil tablets as soon as possible. These adverse outcomes are usually associated with use of these drugs in the second and third trimester of pregnancy. Most epidemiologic studies examining fetal abnormalities after exposure to antihypertensive use in the first trimester have not distinguished drugs affecting the renin-angiotensin system from other antihypertensive agents. Appropriate management of maternal hypertension during pregnancy is important to optimize outcomes for both mother and fetus. In the unusual case that there is no appropriate alternative to therapy with drugs affecting the renin-angiotensin system for a particular patient, apprise the mother of the potential risk to the fetus. Perform serial ultrasound examinations to assess the intra-amniotic environment. If oligohydramnios is observed, discontinue amlodipine and olmesartan medoxomil tablets, unless it is considered lifesaving for the mother. Fetal testing may be appropriate, based on the week of pregnancy. Patients and physicians should be aware, however, that oligohydramnios may not appear until after the fetus has sustained irreversible injury. Closely observe infants with histories of in utero exposure to amlodipine and olmesartan medoxomil tablets for hypotension, oliguria, and hyperkalemia [seeUse in Specific Populations(8.4)]. Elderly patients have decreased clearance of amlodipine. Starting amlodipine or adding amlodipine at 2.5 mg in patients ≥75 years old is recommended. The lowest dose of amlodipine and olmesartan medoxomil tablets are 5/20 mg; therefore, initial therapy with amlodipine and olmesartan medoxomil tablets are not recommended in patients ≥75 years old. Amlodipine is extensively metabolized by the liver and the plasma elimination half-life (t½) is 56 hours in patients with severely impaired hepatic function [see Warnings and Precautions (5.5)]. Increases in AUC0-∞ and peak plasma concentration (Cmax) for olmesartan were observed with moderate hepatic impairment compared to those in matched controls with an increase in AUC of about 60%. Amlodipine and olmesartan medoxomil tablets provided as a tablet for oral administration, is a combination of the calcium channel blocker (CCB) amlodipine besylate and the angiotensin II receptor blocker (ARB) olmesartan medoxomil. The amlodipine besylate component of amlodipine and olmesartan medoxomil tablet is chemically described as 3-ethyl-5-methyl (±)-2-[(2-aminoethoxy)methyl]-4-(2-chlorophenyl)-1,4-dihydro-6-methyl- 3,5pyridinedicarboxylate, monobenzenesulphonate. Its empirical formula is C20H25ClN2O5•C6H6O3S. 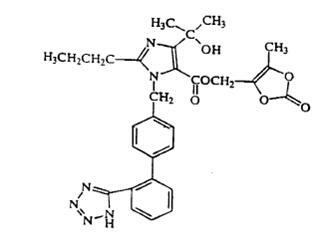 The olmesartan medoxomil component of amlodipine and olmesartan medoxomil tablet is chemically described as 2,3dihydroxy-2-butenyl 4-(1-hydroxy-1-methylethyl)-2-propyl-1-[p-(o-1H-tetrazol-5-ylphenyl)benzyl]imidazole-5-carboxylate, cyclic 2,3-carbonate. Its empirical formula is C29H30N6O6. Amlodipine and olmesartan medoxomil tablet contains amlodipine besylate, a white or almost white powder, and olmesartan medoxomil, white to off-white, crystalline powder. The molecular weights of amlodipine besylate and olmesartan medoxomil are 567.1 and 558.59, respectively. Amlodipine besylate is freely soluble in methanol, sparingly soluble in alcohol, slightly soluble in 2-propanol and in water. Olmesartan medoxomil is sparingly soluble in methanol, practically insoluble in water. Each amlodipine and olmesartan medoxomil tablet also contains the following inactive ingredients: microcrystalline cellulose, pregelatinized starch, croscarmellose sodium, magnesium stearate and colloidal silicon dioxide. The color coatings contain polyvinyl alcohol, macrogol/ polyethylene glycol 3350, titanium dioxide, talc, iron oxide yellow (5/40 mg, 10/20 mg, 10/40 mg tablets), iron oxide red (5/40 mg, 10/20 mg and 10/40 mg tablets), and iron oxide black (5/40 mg, 10/20 mg and 10/40 mg tablets). Amlodipine and Olmesartan Medoxomil Tablets. Amlodipine and olmesartan medoxomil tablet is a combination of two antihypertensive drugs: a dihydropyridine calcium antagonist (calcium ion antagonist or slow-channel blocker), amlodipine besylate, and an angiotensin II receptor blocker, olmesartan medoxomil. The amlodipine component of amlodipine and olmesartan medoxomil tablet inhibits the transmembrane influx of calcium ions into vascular smooth muscle and cardiac muscle, and the olmesartan medoxomil component of amlodipine and olmesartan medoxomil tablet blocks the vasoconstrictor effects of angiotensin II. The pharmacokinetics of amlodipine and olmesartan medoxomil from amlodipine and olmesartan medoxomil tablets are equivalent to the pharmacokinetics of amlodipine and olmesartan medoxomil when administered separately. The bioavailability of both components is well below 100%, but neither component is affected by food. The effective half-lives of amlodipine (45±11 hours) and olmesartan (7±1 hours) result in a 2- to 3- fold accumulation for amlodipine and negligible accumulation for olmesartan with once-daily dosing. The pharmacokinetics of olmesartan medoxomil were studied in the elderly (≥65 years). Overall, maximum plasma concentrations of olmesartan were similar in young adults and the elderly. Modest accumulation of olmesartan was observed in the elderly with repeated dosing; AUCѕѕ,τ was 33% higher in elderly patients, corresponding to an approximate 30% reduction in CLR. Simvastatin: Co-administration of multiple doses of 10 mg of amlodipine with 80 mg simvastatin resulted in a 77% increase in exposure to simvastatin compared to simvastatin alone [see Drug Interactions (7.1)]. Cyclosporine: In a prospective study in renal transplant patients, an average 40% increase in trough cyclosporine levels was observed in the presence of amlodipine [see Drug Interactions (7.1)]. Olmesartan was not carcinogenic when administered by dietary administration to rats for up to 2 years. The highest dose tested (2000 mg/kg/day) was, on a mg/m2 basis, about 480 times the maximum recommended human dose (MRHD) of 40 mg/day. Two carcinogenicity studies conducted in mice, a 6-month gavage study in the p53 knockout mouse and a 6-month dietary administration study in the Hras2 transgenic mouse, at doses of up to 1000 mg/kg/day (about 120 times the MRHD), revealed no evidence of a carcinogenic effect of olmesartan. An 8-week multicenter, randomized, double-blind, placebo controlled, parallel group factorial study in patients with mild to severe hypertension was conducted to determine if treatment with amlodipine and olmesartan medoxomil tablets were associated with clinically significant reduction in blood pressure compared to the respective monotherapies. The study randomized 1940 patients equally to one of the following 12 treatment arms: placebo, monotherapy treatment with amlodipine 5 mg or 10 mg, monotherapy treatment with olmesartan medoxomil 10 mg, 20 mg, or 40 mg, or combination therapy with amlodipine/ olmesartan medoxomil at doses of 5/10 mg, 5/20 mg, 5/40 mg, 10/10 mg, 10/20 mg, and 10/40 mg. Patients discontinued their prior antihypertensive treatment. The mean baseline blood pressure of the study population was 164/102 mmHg. Of the total cohort, 970 patients were treated with the combination as initial therapy. The antihypertensive effect of amlodipine and olmesartan medoxomil tablets were similar in patients with and without prior antihypertensive medication use, in patients with and without diabetes, in patients ≥65 years of age and <65 years of age, and in women and men. Limited data exist in patients ≥75 years of age. There are no trials of amlodipine and olmesartan medoxomil tablets demonstrating reductions in cardiovascular risk in patients with hypertension, but at least one pharmacologically similar drug has demonstrated such benefits. For more information call Alembic Pharmaceuticals Limited at 1-866-210-9797. Other brands mentioned are trademarks of their respective owners. The makers of these brands are not affiliated with Alembic Pharmaceuticals Limited or its products.